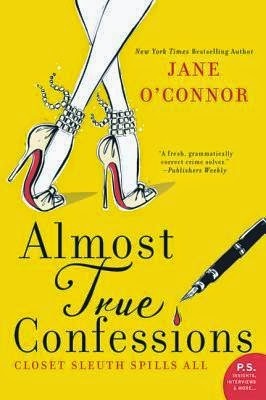 Almost True Confessions is a mystery. Kinda' sorta'. I mean, it is, but that's not all it is. This is a lighthearted book about a woman named Rannie who is a bit of a buttinsky. But when people are dying all around you, it's kind of expected, no? No. I didn't think so, either. But she's got some chutzpah, this chick. She's in the midst of several murders, all the while copyediting a manuscript for a big secret book that is to remain completely under wraps. But why? What's the big secret? Rannie keeps reading and editing, but she doesn't really understand why this book is such a reveal. She's not finding anything that seems SO important. Or SO exclusive. I liked this book mostly because it is set in New York City. And I'm homesick. A little. There's not enough of the city in there for me to get my fill, but I'll take it anyway. And there are some stereotypical NYC situations that kind of rub me wrong a bit, but I get it. I get that the setting is important. These bits and pieces of Rannie's surroundings are a part of the story. A part of how her mother, mother-in-law, son, daughter, family friends and not-quite-boyfriend Tim all fit together. Perhaps the glue, as it might be looked at. Although I'm not sure. It probably could have been picked up and dropped into any other city and worked as well, so it's not a NEW YORK novel. Which isn't essential, I just didn't want to mislead. Sounds like this was a fun read! Things have been crazy here. A light read sounds great!